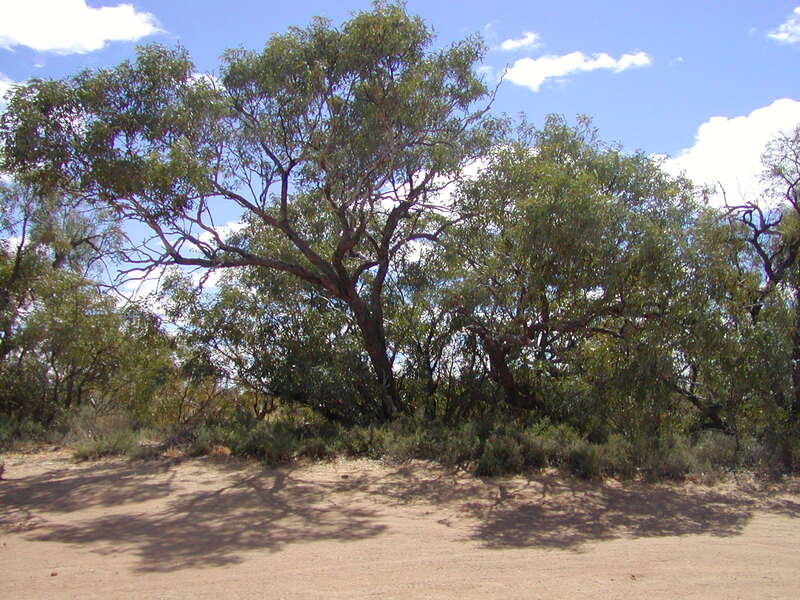 The country around Mt Isa was really lovely, with red, rocky hills, covered in white, multi-trunked eucalypts (like Mallees), a wide assortment of bushes and grasses and dips where creeks would flow in the wet season. The road was one lane wide bitumen to Boulia, where we had lunch in a park. There is a mystery light, called the Min Min, which has been seen by many people in this area. The phenomena is said to appear as a luminous oval, like a florescent football, and has been reported to have been seen ahead of vehicles as well as behind. No-one has ever been able to catch up with it, and some say that the only way to do so is to imbibe in a recipe involving barley, malt and sugar! But enough sightings by sane, sober and intelligent persons have occurred to discount that recipe! To date, we haven’t seen the light. 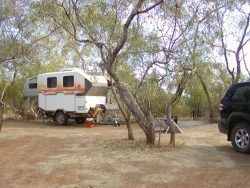 Not far out of Boulia, was Springvale Road – our road to take to get to Gumhole Campground in the Diamantina National Park. What an incredible contrast in the country on this road. 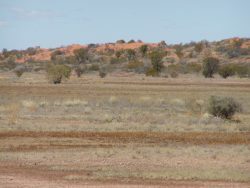 We travelled approximately 160kms on a dirt road, with sections of bulldust, gibber plains and where, for more than half way, the country looked like a moonscape. There was not one feature at all – no grass, no hills, nothing. It was a really surreal feeling and we both commented that we could be heading to the end of the earth! The second day we drove to Hunters Gorge, 11kms further into the park. Camping is allowed there also, but it is more open and windier apparently. The Mundewerra Waterhole there is much bigger and deeper than Gum Creek, and good fishing and water activities can be done there. There are also large rocky hills to walk up. We also drove to the park headquarters and on the way there was a sign saying “Diamantina Channels”, where we travelled over many rivers, all lined with spectacular Coolibah trees (my favourite tree to date! ), river red gums, acacias, hakeas and grevilleas (although we haven’t spotted the grevillea yet). 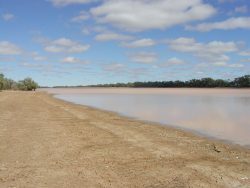 Yesterday we did the 100km Warracoota self-guided circuit drive, which took us over kilometres of claypans, then large sections of gibber plains, passed Mitchell grasslands, saw cattle yards, Lake Constance, which is one of the natural lakes, once used by past station managers for water sports such as water skiing. 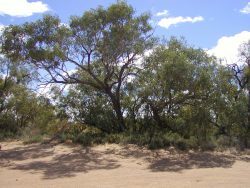 Nowadays, it is a refuge for water birds and on the banks, budgerigars, corellas, galahs and honeyeaters can be seen. On the way we wound our way passed many red sand dunes which were just like the ones in the Simpson Desert with shrubs, small trees and Spinifex growing in red sand. These dunes are now stationary (and have been for the last 8,000 to 12,000 years) and are parallel just like the Simpson dunes. The dunes were formed millions of years from sediment from the Diamantina River and the red colour comes from high iron content. 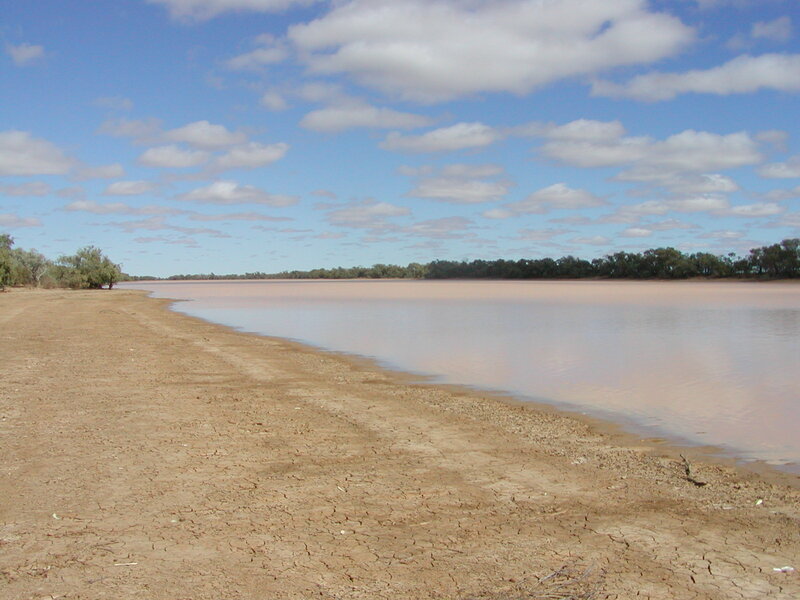 We had lunch at the Warracoota Waterhole, which has never been known to run dry, and it is much deeper and narrower than other waterholes in the park. 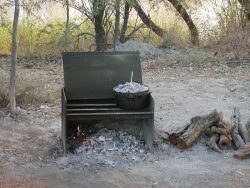 We had a great day and learnt that every feature of the park had its own special use, in the past, for the indigenous Maiawali people, claypans for example, were used as drawing boards, sketching sand drawings to educate their young, gibber stones used for knapping (chipping flakes for stone tools) and the waterholes for fishing of course. 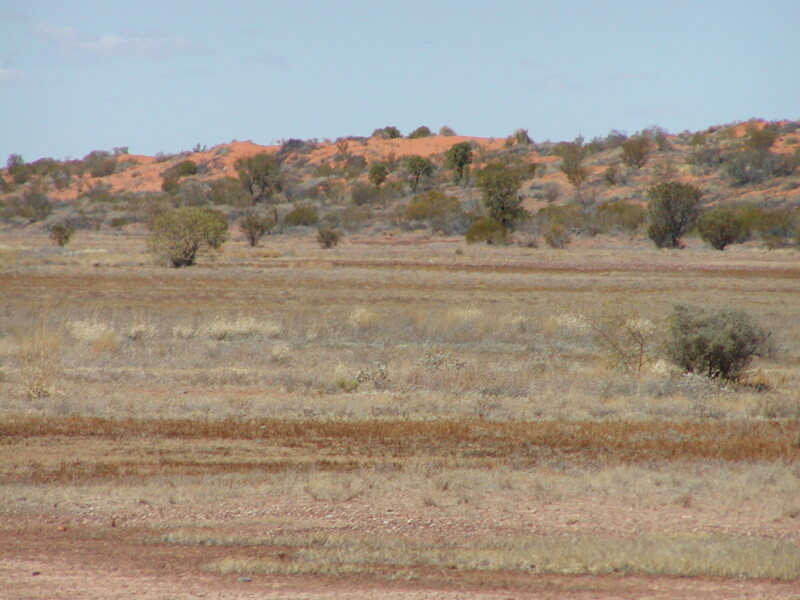 Grasslands were used for hunting and the Mitchell grass seed was collected and ground for flour and dampers. 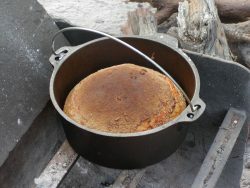 Talking of bread, I made a loaf after we got back from the drive and baked it in the camp oven with coals under the oven and on the lid. The result was a perfect loaf and we had some with cheese after dinner (lamb chops and spuds). We are looking forward to having this bread for lunch today. We’ll leave tomorrow, Saturday 25th August, and head to Welford NP, north of Quilpie. 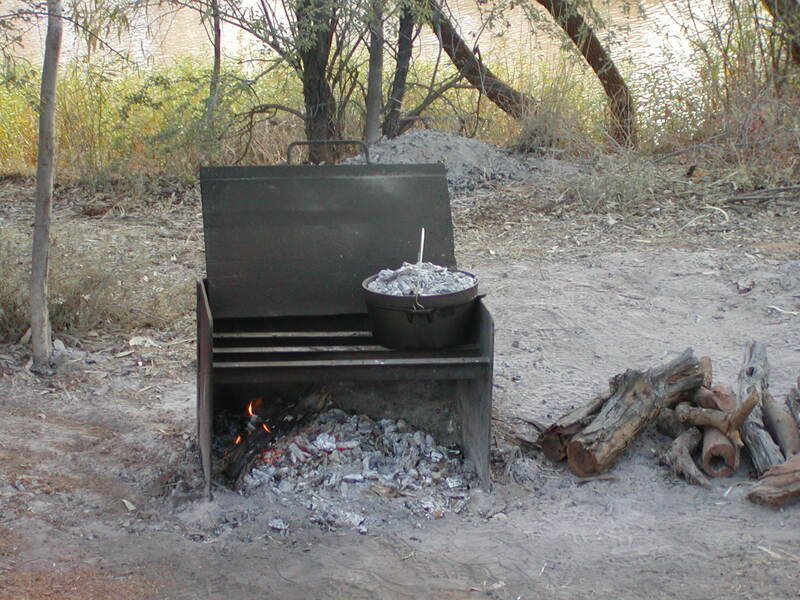 We’ll probably have to go to a town and get some water and supplies fairly soon. margrusstravels.blogspot.com is very informative. The article is very professionally written. I enjoy reading margrusstravels.blogspot.com every day.